Friday the 13th of June, 2014. Reviews: AMONG THE LIVING, DA VINCI’S DEMONS Season 2, THE DARK SIDE OF LIGHT, DRACULA (1974), EDGE OF TOMORROW, GAMBIT (2014), L’ÉTAT SAUVAGE/LE GRAND FRÈRE, THE MONUMENTS MEN, THE RIVER MURDERS/SINNER, THE 7 RED BERETS, SON OF BATMAN, STRIKE BACK, and more! 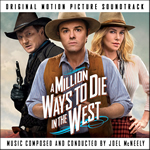 FAMILY GUY’s Seth MacFarlane once again stretches the boundaries of comedy and good taste with his latest film A MILLION WAYS TO DIE IN THE WEST. 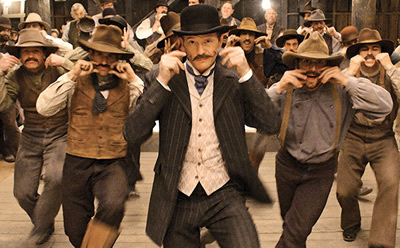 Serving as the film’s primary multi-hyphenate – writing, directing, producing and starring in the film – MacFarlane serves up a comic wild west that mixes grandeur with hilarity, terrific performances with outrageous mayhem, and a touching love story with the kind of crude, gratuitous potty humor that MacFarlane is known for. Q: How did you get involved in this project? Joel McNeely: It was a project that Seth has been talking to me about for a couple years now. The script has actually been around as long as TED, they’ve been working on it for a couple years. When we were working on the record he told me about it and said that he’d love for me to score it. And when the movie happened he asked me to do it, and I was thrilled. Q: Now a title like A MILLION WAYS TO DIE IN THE WEST might prompt the idea of Italian Western music, but you’ve hearkened back to the grand Hollywood Westerns of Bernstein and Moross. What prompted that particular approach? Joel McNeely: I suppose that would have been my choice anyway, but Seth from the very first discussions knew that’s what he wanted. He didn’t want it to venture anywhere close to Spaghetti Western territory; he wanted to keep it right in the tradition of the John Ford Western. Seth is a big film music fan, and he loves those sweeping, rollicking scores of that genre. That’s just really what he heard and wanted for this movie. Q: Would you describe the development of your themes and their integration across the arc of the score in the film? Q: How much input did he give as you were developing the score? 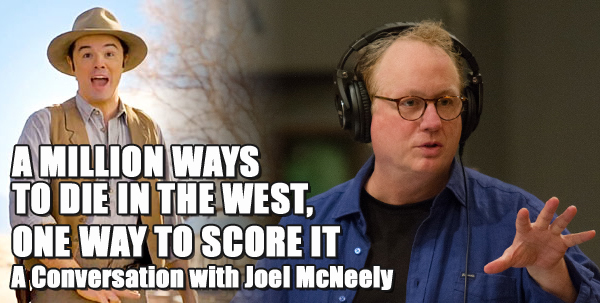 Joel McNeely: His input was, first of all, in guiding me with the themes and the kind of score he wanted, and then kind of setting the stage for me, as a director, letting me know what he wanted and then stepping back. I had done three very extensive mock-ups, one of the main theme and then two of the main sequences in the movie and he called me up and he said “These are great, but I’m guessing [the mock-ups] take a lot of time and effort, right?” I said “Yeah. Actually they do.” And he said, “Well don’t bother with them anymore, I want you to focus on writing. I hired you because I know what you can do, and I like your music and I would no more hire an actor and tell them how to act than I’m going to tell you how to write. So just forget about the mock-ups, I’ll hear it at the sessions, and it’ll be great.” And then he just stepped back and let me put the time that I would have spent toiling over mock-ups and put that into being creative and really crafting the score as well as I could. That was a great gift, just that freedom… I would come to work every day, and not even take a look at my sampler! Just sit at my piano and compose! Q: That’s a rarity these days in Hollywood! Joel McNeely: Oh my God, you have no idea how freeing that is! Q: Now the score follows the journey of the story, obviously, from Albert’s loss of Louise to the advent of Anna, and the threat of Foy and Clinch’s characters. How did you map out how the music would be following that journey? Joel McNeely: I would say that the spotting of the film was already clearly defined in Seth’s mind. He’s a man who really knows what he wants. There’s no second guessing. Going into a spotting session, he is absolutely prepared and sure of where he wants the music, and what he wants the music to be. So once I got an idea of that, then I knew what the major sequences were; I developed three of four sub-themes, and then I started to just craft the score together. I tried to space out the themes so that I’m never using too much of one theme so it doesn’t sound repetitive. And then I just got to work on the major sequences of the film, which were the saloon brawl, the shooting montage, and of course the train chase. Q: What was your technique of integrating your thematic elements into those aggressive and yet cohesive action cues? Joel McNeely: I always feel like, especially with a movie like this, which is so thematically based in almost kind of an old-school way – you know, you have this grand statement of the opening theme over the Main Titles, which in itself is a wonderful rare thing to have a whole Main Title sequence set to music and images. That is in A-A-B-A form, so I’ve got the A- and the B-parts to play with, and then for the fight sequence, I thought I would just quote the themes to give them resonance. I also quoted the song, “A Million Ways to Die,” which I just did to make Seth and I laugh! I wasn’t sure if anybody was even going to make that connection. And then I went back and forth between that and the main theme. Q: What were the challenges of being the straight man and knowing when and how to step aside to let the humor play on its own? The closest I ever got in to playing comedy for this score was the cross-cutting between the parallel action between the brutal, vicious, over-the-top violence of the saloon fight, and then cutting to Albert and Edward with those ridiculously comic fake fisticuffs! The music was really supposed to point out the counterpoint between those two, and that was the only time I really stepped anywhere close to the line of being comedic at all. Q: Then you’ve got the barn dance, this very authentic sounding old fashioned square dance. What preparation did that piece require of you? Joel McNeely: It’s funny, that’s just a little bluegrass tune that I wrote before they’d even started shooting. We did “The Mustache Song” and that little bluegrass tune in advance of shooting so that we would have something to pre-record for them to play to. When it was time to lay it in, and I went back and rewrote it a bit and we re-recorded it with a new bluegrass band and then laid the orchestra on top of it – Seth loves the old MGM musical conceit of having a bluegrass band but then a symphony orchestra comes in at the top, like SEVEN BRIDES FOR SEVEN BROTHERS, and it just works! It’s silly but it works. So you’ll hear orchestra on both of those numbers, the “Mustache Song” and the barn dance. 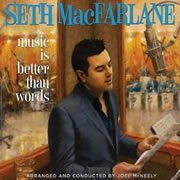 Q: How did you work with “The Mustache song,” Seth’s transformation of a historical Stephen Foster song from 1862? Joel McNeely: That’s another one that Seth pulled out of his head. He’s got this unbelievable knowledge of music in all different genres, and he found that song and sent it to me. It’s almost like a Sea Shanty with a rollicking 6/8 feel. I just had no idea how we would make that into a barn dance, so I called him up and I said “how about if I just ram this into a 4/4 meter and make it more of a bluegrass song?” So we experimented with that, and in the end it seems to work pretty well. If you heard the original song in its original form you might not even recognize it as “The Mustache Song” that’s in the movie. Q: I wanted to ask about “Albert Takes a Trip,” which is a wholly different musical element for this scene – kind of a “Pink Elephants on Parade” moment in this otherwise straightforward narrative. Joel McNeely: Right! That came very late at the end of the process. There was a sequence that was shot and not all of the scenes from the initial sequence worked as well as they hoped they would. They went back and had about a week of reshoots and that was one of the things they reshot. So there was a whole new set of scenes and those took a while for the computer imagery to be rendered and weren’t ready until the very end of the scoring process. I never even really saw it cut together until right at the end. It was a bit of a tricky sequence for me, because it starts out with his birth, and then there’s a gag with him as a little kid putting a tooth under the pillow, and then there’s the Gilbert Gottfried segment, and then he’s riding a velocipede. And those were all kind of grounded in reality of some sort, and then after he gets chased by the bikers and shot, then it goes into a fantasy sequence that’s not reality. Initially I was going to score the whole thing, but I couldn’t really find a way of doing it. I did score the velocipede sequence and in the end we felt like it didn’t need music, so we started the sequence where Albert wakes up in this netherworld. Then from that point it was really just a matter of connecting the dots, just following the storyline, which was pretty trippy. Q: Then we have the Alan Jackson song which closes the film. How did that come about? Joel McNeely: We had talked about writing a song from well before they started shooting. There was some discussion at one point that maybe instead of an orchestral Main Title we would have a song there. So we thought we’d give ourselves all the options and decide later. We started with a lyric that Seth wrote. He sent it over and I used about half of that initial lyric and then came up with a different middle section, which I sent back to him in a rough demo with me singing nonsense syllables, so he could get the melody and the rhythm. Then he revised the lyrics and had a few new ideas for that, so I changed the melody… and this went back and forth by email for a couple days. Then we had a finished song, which I demo’d out and actually did a scratch vocal myself. The demo came out very well, it was fairly presentable so we could send it to the record company and to Alan Jackson’s people. Then it was just a matter of weighing where it would work best, whether to use it as a Main Title or at the end. I think the decision came down to less about whether it was right for the Main Title and more about that it was really right for the end of the movie - we have the Jamie Fox cameo and then we come slamming in with this ironic, ‘60s kind of Western song, which felt really good. Q: What kind of tone were you looking for in the song? It seems to have a little bit of a hint of Frankie Laine/Marty Robbins and yet it’s a little more modern, and brings us back to reality at the film’s end. Joel McNeely: I was a little nervous about that at first, because we’ve been so proactive about establishing the genre, and then this song’s going to break from it. But at the end of the movie, I thought, okay, now we have license to jump into the ‘60s and bring in some electric guitars and the real cheesy male chorus, and we just started putting the track together, and as we would put the different elements on it, if they made us laugh, they stayed in. The chorus always made us laugh, the twangy electric guitars made us laugh, so it was almost formed by what was entertaining to us! Q: How much time, all together, did you have to develop and record your score? Joel McNeely: This was a really great process. We spotted it in early February, and scored in mid-April, so I had two and a half months. It wasn’t too much time, but it gave me time to really get into some detail and really work out some things that took time and craft, and do some more intricate writing, especially with things like the shooting montage. That kind of writing just takes time. It allowed me the luxury of really boring down on something and giving it more attention than I have if I was doing a tighter schedule. Q: What size orchestra did you use and how many sessions were required to record the score? Joel McNeely: We scored for five and a half days. Not consecutively – we did three and a half days and then we did another day and finally a day and a half a week later. The biggest orchestra was 95 pieces, smallest was 65, and then there was a third orchestra that was in between those two in size. We had one session at the very end, after everything was finished and we were on the dub stage. I had written an End Credit suite because Seth really wanted the tradition of movies when they had specifically-composed End Credit suites, which is not really done any more – they’re all edited together from score, and he wanted me to write fresh, an idea that I loved. So I did it to the timing that I was given for the length of the credits, and we recorded it – then it turned out once they got the graphics back that, at that timing, the End Credits graphics were moving too fast to fit all the credits that they had in – they had to slow the thing down, which meant the music was short by almost a minute and a half. So I said, well, I’ll figure out something we can edit in, but Seth was rally adamant about it: “No, we’ve come this far and we haven’t “Frankensteined” anything together, that’s a term he uses, and I just really don’t want to start now. I’d rather you just go back and recompose the thing with new material for the extra minute and a half, and make it a suite just the way you like it and we’ll go back in. So they hired a 95-piece orchestra for one session for us to go back in and fix the End Titles. Q: That’s really speaks to Seth’s believing in the power of orchestral music and his commitment to getting it right for the film. Joel McNeely: Yes, exactly. But, unfortunately, that was after the soundtrack record had been mastered, so the End Title music you hear on the record is not the final version that is in the movie. But we’re talking about doing a deluxe iTunes release along with the DVD [estimated for September] to release that and some other additional cues that weren’t on the record, probably another ten minutes of music. 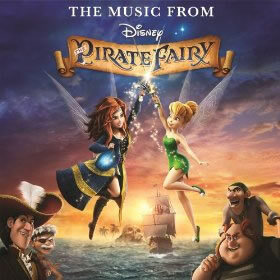 Q: I wanted to also ask you about your score for THE PIRATE FAIRY, which returns you to the world of the animated Tinker Bell features you’ve been doing. What were your experiences on this picture? Joel McNeely: Sheer panic! That was a difficult movie! It was a movie that had a very accelerated post-production schedule, for a lot of reasons, not having to do with the music. It was enormously difficult to write because the music was quite dense due to the structure of the film. In these Tinker Bell movies there’s usually a balance between the light and the medium light and then the intense scoring, and obviously the intense stuff just takes longer to write. This movie was about 25% of the light stuff, and then, boom, we’re into full, intense orchestral music for rest of the movie! I wasn’t really prepared for how many battle sequences there were - there’s one fight sequence alone that’s nine minutes long! You know, in that style, in the Korngoldian style, you just have to write a lot of notes! So I was fairly exhausted when I finished that. Q: Did the budget on that film permit a full-sized orchestra? Joel McNeely: Oh yeah. 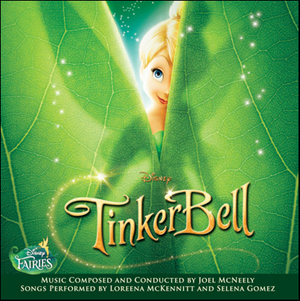 The blessing of these Tinker Bell movies is that the music budget has always been more than ample to do pretty much anything I wanted to do, and it was always protected even as budgets were cut over the years. The music budgets were protected and I was able to have pretty much any size orchestra I wanted to have. 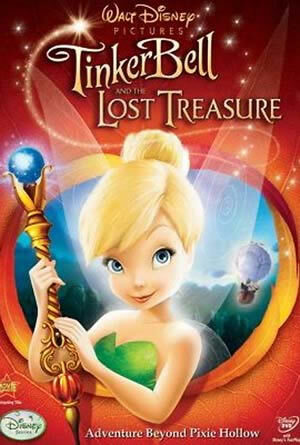 On the second film [TINKER BELL AND THE LOST TREASURE], when I found this great Irish choir that sings in what they call “Gaelic Mouth Music“ – just this really different sound – they allowed me to hire them and we went over to Dublin and recorded them. They’re kind of an integral part of the score, which is a really unique sound to me and made it something really different. Each one of those films has been a unique pleasure. Q: Has there been a thematic integration of your themes throughout that series? Joel McNeely: Oh yeah. There are two main themes that cross-pollinate between all of them, and that’s the Tinker Bell Theme and then what I call the Fairies Theme, which is more the broad theme for the overall franchise. The Tinker Bell Theme is specific to her. And those you’ll hear in all the films, but also each film has its own set of unique themes as well. Q: What were the challenges for you in scoring the animated world of Tinker Bell? Joel McNeely: It’s very labor-intensive because the music very closely follows the plot line and the action. You’re hitting things way more than you would in a live-action film. It can be much denser; the writing can be much more active than you would do in a live-action film, so all these things take an incredible amount of detail. I write by hand in Photoshop – I write on a 21” tablet that’s mounted on the piano – but even so it’s a lot of black dots! Q: Speaking of animation – and Seth MacFarlane – you’ve also worked on a few episodes of Seth’s AMERICAN DAD. How did that come about? Joel McNeely: Seth and I had met years ago in 1998 when Seth first came to town, and then they needed someone to come in and help out on AMERICAN DAD about five years ago. I got a call and I went in – he’s not actively involved in that show from a producing standpoint other than doing the voices, so I met with the show’s producers and then I went over and met with him, and said hi. We’ve just kept in touch, and we had lunch one time and talked about doing a record, and that happened. I spent about a year working on that first record [Music Is Better Than Words] , which was enormous fun, an exhilarating project, and we’ve been doing stuff ever since. I did the Oscars with him and wrote the opening and closing numbers for that, and then I spent the last two years working on a Christmas record with him, which will come out in November on Universal Republic. We’re both enormously proud of that record. I think it’s something very special. He sings like I’ve never heard him sing! Q: What do you have coming up next, film music wise? Joel McNeely: I’m doing the very last of the Tinker Bell movies. The story is ending with the sixth movie and so I’ll be jumping into that pretty much around now! We’ll be recording in October. Thanks to Dan Barry at Chasen & Co. for facilitating this interview, and to Joel McNeely for warmly sharing his time and perspective. 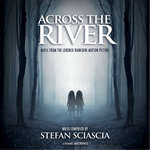 ScreamWorks Records has released the chilling soundscapes of double bass legend Stefano Sciascia from the new Italian chiller, ACROSS THE RIVER (Oltre il guado). Co-written and directed by Lorenzo Bianchini, is a moody, meditative horror film where one man’s quest for knowledge leads down a dark path of supernatural chills and scares. The soundtrack album is a compilation of original music interspersed with pieces licensed from the composer’s previous albums (seven of the 10 tracks had previously appeared on Sciascia’s acclaimed concept album Lux ex Tenebris (2010), a Gothic sounding visual-aural-musical narration highlighting the versatility of double bass. Two pieces come from the composer’s earlier album Mantra 22.22 (2004) and there’s one original composition which the composer wrote especially for the film. Despite the divergent source of the cues, there is a sonic unity to the tracks, a cohesion which leads to potent scare material. Sciascia’s score is of the meditative variety, spooky, haunting, apprehensive, and no doubt very effective in the film but it makes a somewhat difficult listen on its own. Inasmuch as horror film music in large part has dispensed with tonal orchestrations and shifted into truly scary musical sound design, Sciascia’s material indeed lays down a commendably spin-tingling sonic orientation; let the listener’s tastes determine how well it works for listening in your living room or on your iPod. 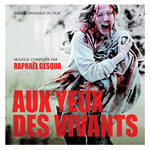 Coinciding with the film’s French premiere, ScreamWorks Records/Kronos Records offers a mix of symphonic tonality and percussive, the delightfully wicked score for AUX YEUX DES VIVANTS (US title: Among the Living) by French composer Raphaël Gesqua, who’s had some notable experience in providing chilling soundtracks for a number of horror films and shorts. The opening, title track, consists of a deliciously diabolical violin performance over pounding piano and drums, morphing into an accelerating rhythm and melody line that carries the listener forward into some aural landscape of nightmare dread. It’s a thoroughly remarkable opening track that starts out the score with a rushing rage, which is quickly dispelled by a very atonal mix of found sound, whistling, reverberant electronica, and weird, processed sound and we’re quickly in sonic trauma territory. Where the label’s other recent releases, Sciascia’s ACROSS THE RIVER (see above) and Michael Wandmacher’s 13 SINS largely create their sense of unease and imminent peril through angular atonality and sampled sound designs, which works fine in the movie, Gesqua’s adroit orchestrations and mixture of tonal instrumentation and depth of sonic texture makes for a much more compelling listen on its own, apart from its film. “Always Dreamed of It” sets up an onrushing percussion/violin/piano beat on top of its wafting layers of synthetic tonality which is quite compelling. Gesqua’s whistling motif recurs in “Klarence, My Son/Main Title,” where it builds a potent and increasing sense of incoming dread as it is joined by a festering buzzing drone from synths that quickly absorbs tonality in its relentless drive across the soundscape; and again in the foreboding command of “Kill Them,” as if the whistling represents forces whose commands. There’s an innocuous, happy rhythmic motif heard in “Canteen Fun” and “Childhood” which is rather compelling, and a pretty, pastoral melody in “Welcome to Blackwoods” that is innocently nice. The “warped” sound of “Entering,” caused by adding a variable speed “wow” to the recording, creates a uniquely effective suspense motif which, outside of popular music, I don’t think I’ve heard in a film score before. Reprised in “Blackwoods Stories,” it’s very effective in creating a sense of wrongness and a nightmarish queasiness – as is the symphonic stinger when “Bad Nightmare’s” piano and howling violins pounce at 0:44, achieving a palpable jump in the listener. With 33 tracks covering about 70 minutes, AMONG THE LIVING is sonically and texturally interesting, crafting its sense of musical horror through careful placement and manipulation orchestral and other sounds that, across the film’s narrative journey, maintain an uneasy journey of intriguing musical sounds. That wild, opening track is given an extended 5-minute reprise at the end with “Among the Living: End Credits (Full Version),” which culminates in a poignant 2-minute piano piece, ultimately dissipating into the ether at track’s end. Through its brooding tonalities, inventive sonic integration, and striking motif structures, Gesqua’s score is quite a revitalizing effort in French horror scoring, and a welcome score for home listening. A SIP OF HOT TEA (2011) is a documentary portrait of the painter Cedric Carré. The artist explains his vision of his art and takes us to the heart of his creative process. “It was an opportunity for me to work again with minimalist and repetitive styling in order to illustrate the creation of the painter’s contemporary works. This [13 min.] 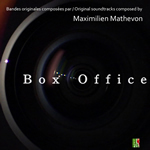 musical suite consists on actual material used in the film and alternative versions” Mathevon explained. The music is austere, harp and reflective synths, an intricate and intriguing sonic portrait of the artist. ETUDE EN NOIR ET BLANC (unfinished, 2013) consists of the preliminary work Mathevon composed for a political documentary involving the Cold War period. Unfortunately, that movie remained just a project and never saw the light of day. Mathevon was able to work with jazzy moods, creating a unique and stimulating sonic tone poem for advancing trumpets over bass and bongos. VOTIM MAMA (2010) is a documentary about elections in Papua New Guinea and the struggle of a candidate against the corruption that prevails there. “The idea for me was to compose a discreet and minimalist music that could recreate the bittersweet atmosphere of the film, ranging from hope and determination to resignation and sadness,” said Methevon. Phrases, blurts, and echoes of winds and strings revolve around a slow pace of piano notes dominate, occasionally broken by a very pretty melodic interaction between flute, piano, and strings. The music is unusual but very well organized and orchestrated, and thoroughly enthralling to listen to. The digital album is available on iTunes and Amazon. The music is an acoustic treasure trove of sonic colors and historical instrumental grain, revolving around a soundscape dwelling largely in the low registers. Intricate melodies, persuasive rhythms, beaten drums and fragile filigrees combine to give the expertly scored music its fascination and effectiveness. The score also contains a wealth of sublime emotional resonance, especially in tracks like “The Voice in the Vault,” where the string passages take on a powerfully impassioned voice. Other tracks contain a variety of progressive development and orchestration, many roaming through territories of poignancy, power, sublime evocation, and shattering aggression all in the same track. Unique to this season, which saw the story venturing beyond Season 1’s Florence, Italy environment, to explore adventures in South America, are the score’s opportunities to add new exotic textural breadth to its sound palette. “The sounds of Peru were a huge influence for me,” explained McCreary. “The challenge was to take all the Renaissance instruments and themes I’d accumulated during the first season and add a whole new sound to them. As always, I strove for authenticity. The Peruvian vocals throughout the season are genuine pre-Columbian indigenous chants that we recorded with singers who trekked down from the mountains to a recording studio in Lima specifically to perform on this score. When Da Vinci sees Machu Picchu on screen, the score quotes a song from the region that is over five hundred years old. It is not often that a television show offers this kind of creative opportunity!” There’s a healthy amount of music bundled into this digital album, with close to 100 minutes of music (requires 2 CDRs to burn); of the 19 tracks, four of them are in excess of 10 minutes in length and five others are in the 6-7.5 minute range, so there are some fine opportunities for long form thematic and atmospheric development in the music. 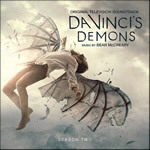 The Season 1 soundtrack, released in 2013, contains the standalone main and end title music; which are not repeated on the Season 2 disc, but the theme makes enough incursions into the episode score cues to remain closely at hand. Mexican film composer, Gus Reyes has provided a serene, haunting orchestral/choral score for EL LADO OSCURO DE LA LUZ (THE DARK SIDE OF LIGHT), a powerful 2013 psychological thriller based on the true story of a serial killer who was sentenced to death in the electric chair execution but survived the ordeal. 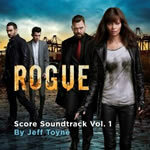 The score has been released digitally and on CD by the joint venture of Moviescore Media and Kronos Records. “When I received the film for the first time, I was blown away by the story,” said Reyes. “Our main character becomes a religious serial killer thru the film, so I decided to draw with the music that movement in his mind. First I had to find a subtle polyrhythm to make an ostinato that could give the music a profound sound and the movement I think the film needed. Then I create the main theme to go above it. I used a solo violin in its low register to portray the loneliness and pain of this character.” The beautifully orchestrated symphonic/choral material blends wonderfully into a rich, vivid sound that conveys a potent allure; more mysterious semblances convey a more furtive, menacing tonality through strings, piano, and haunting solo voice, while some tracks entwine into severely spooky sonic interactions. For the film’s emotional climax, “Requiem del Lado Oscuro,” Reyes provided a magnificent Requiem or mass featuring soprano with full chorus. 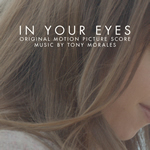 The album concludes with a song, “No Llores” sung by Ivonne Guevara, accompanied by solo violin and piano; it’s far from the typical pop song stuck on the End Credits, it carefully retains the loveliness of sound found elsewhere in the score and is a work of beauty all by myself; in addition, Reyes has arranged an 11:44 minute concert suite of the score’s primary attributes. This is a marvelous, beautifully conveyed score which maintains a continual thread of serene melodious and choral material throughout its variegated forms, and really makes for a breathtaking listening experience from start to end. 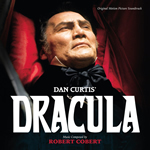 The premiere release of Bob Cobert’s romantic score for Dan Curtis’ 1974 TV-movie version of DRACULA starring Jack Palance as the infamously fanged Transylvanian Count (and originally called BRAM STOKER’S DRACULA until Francis Ford Coppolla bought the rights to that title for his film), comes as a very welcome surprise. 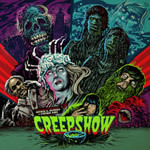 It’s the first of Cobert’s many TV-movie horror scores of the ‘70s and ‘80s to be granted a full soundtrack album outside of 1976’s feature film BURNT OFFERINGS (issued in 2011 by Counterpoint Records). A 2000 compilation from Varese proffered short excerpts or suites from ten of Curtis’ films scored by Cobert, so the advent of DRACULA is quite a treat. Cobert was the first composer to treat Count Dracula in a romantic way (a couple of James Bernard’s DRACULA scores for Hammer featured sumptuous love themes, but Dracula himself was always configured with the aggressive, powerful Dracula theme Bernard had written for Hammer’s first DRACULA movie in 1958; John Williams followed suit for John Badham’s 1979 DRACULA as have most composers scoring the iconic Dracula in films since. Cobert’s music for DRACULA conveys a rapturous, classically romantic flavor for Palance’s interpretation of Bram Stoker’s Transylvanian Impaler. “I think I’m the first person who ever thought of writing a love theme for Dracula,” Cobert told me in a 1983 interview. “I decided when I was doing that to take a chance and actually make it Dracula’s love theme, so at the moment when Dracula has the major bite on the girl, up came a hundred violins soaring away!” The melody and treatment of the theme and much of the music retains a slight Hungarianish air – Cobert’s “Main Title” music presents the theme in a vibrant but beautifully serene flavor, the swaying melody line affording a slight pathos to the Dracula character. Recorded with a 40-piece orchestra in London, the score has a fairly rich sound, if somewhat restrained to the effective low registers. Cobert’s action music, exemplified in “Harker’s Dilemma,” “Attack at Dawn,” and the like, is vivid, strikingly orchestrated, and compares favorably with James Bernard’s iconic aggressive Dracula music. His music for the climax (“Dracula At Dawn” and “Impaled”) is impassioned and sympathetic, the soul of the wicked vampire finding redemption as a tragic figure after death. A fine score happily preserved on disc after forty years; Jeff Thompson adds informative commentary about the film and the music in the 8-page album booklet. Beck’s resultant score is uneven but effective in capturing a potent, industrial sound appropriate to the mechanistic future and the bizarre time loop Cruise’s character is revolving in; the music cycles through certain motific elements that suggest Cruise’s seemingly endless time loop cycles as he keeps reliving the beach invasion scene, but each time he comes back with a little extra knowledge. “At first, we were hung up on the super soldier aspect and had a heroic theme with French horns,” Beck said. “It was important to Doug that [the audience] be able to laugh at the scene. After multiple attempts at doing it [with] a more traditional hero melody, we played it more like a punk rebel and sampled bits and pieces of the orchestra and distorted them.” The score is thus rhythm based, with huge planks of distorted and grinding metallic sounds and blaring percussive beats that give the story and its distorted sense of recurring time much of that chaotic sensibility. Those heroic horns do come in near the end, when Cruise’s recurring journey begins to unravel and the mystery nears its solution. Some of these elements may tend to wear out their welcome on the album more than they do in the film, where the context allows them to work splendidly in conveying and propelling the story, but Beck’s music is certainly successful in keeping audiences on the edge. Joel and Ethan Coen scripted this remake of its 1966 namesake, which was made in 2012 but held for release until last April. 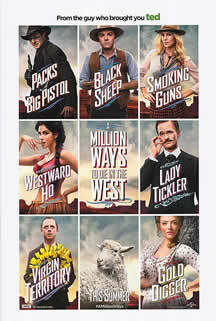 The film tells of an art curator (Colin Firth) who decides to seek revenge on his abusive boss (Alan Rickman) by conning him into buying a fake Monet, but his plan requires the help of an eccentric and unpredictable Texas rodeo queen (Cameron Diaz). For the film, Rolfe Kent has designed a catchy caper movie score with plenty of swing and plenty of verve, which is delightfully captured on disc. “It’s quite a jazzy/swing score,” Kent described. “That came mostly from the way Harry [Colin Firth’s character] moves around the Savoy Hotel; it had such a fun, quirkily nimble flair, and it pushed me in a sort of Mancini direction.” The score ranges through a variety of moves, from OCEANS 11-styled pop-jazz to a bit of bluegrass and a touch of faux salsa – and that’s just in the opening Overture. “There are themes for the main characters, and then there are also themes for certain emotions,” Kent continued. “There is a love theme for the relationship between PJ and Harry, and there’s a big timpani-drum led motif for Alan Rickman’s bold and self-confident Shabandar character. 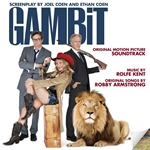 Colin Firth’s Harry has a few different themes, for when he’s pensive, when he’s on a caper, or when he’s simply being himself.” Through its many breezy flavorings and interlaced spices, Kent’s GAMBIT makes for a very pleasant soundtrack album. 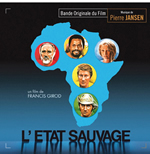 On this disc, Music Box Records has released Pierre Jansen’s scores from two movies directed by Francis Girod, both for films set in Africa and exploring social issues of that continent. L’ÉTAT SAUVAGE(1978) deals with the initial period after decolonization of a fictional African state, while LE GRANDFRÈRE(1983) resets Sam Ross’s novel Ready for the Tiger to Africa (and Marseilles) and, through the story, explored social issues concerning the integration of the first generation of French of North African descent. Both scores are devoid of African music as Jansen focused on treating the harsh racial issues as human problems, with music that is oriented around social situations and events rather than landscapes and environments. The former score is presented in two long suites (16:44 and 12:58), while the latter is provided across eleven tracks. Jansen’s orchestrations for both are highly interesting and modernistic, favoring flutes and strings on the former, organized around an angular journey across a strenuous soundscape that makes for an extremely interesting listen. “L’ÉTAT SAUVAGEdeliberately avoided any musical reference to Africa as it was my intent to avoid at all costs producing an illustrated postcard in sound.” recalls Jansen. “To resurrect the harsh savagery of racism – and even of the types of racism denounced in the film to the point where the viewer is led to wonder who it is exactly who is the savage! – I opted for a Westernized, jerkily rhythmic and dissonant score, which can be heard right from the main title, which is particularly jarring.” The latter score is more melodic and thematically-structured. “For LE GRAND FRÈRE, I let myself be inspired by the general climate of the film and I also wrote in a highly rigorous manner, image by image, out of which came a result approaching a more traditional type of film music. One can distinguish two principal streams running through what I contributed: on the one hand the symphonic tracks intended to enhance the dramatics of the screenplay and the psychology of the protagonists with impressionistic touches in places and on the other hand I created the majority of the source music myself.” The score is primarily orchestral, except for “Thème Abdel” which is a very compelling electric guitar solo over bass, drum kit, and spacey whorls of synth – the style and sound of the guitar and synth are similar to Edgar Froese’s “Talking to Maddox” from the 2005 album “Orange Light Years” and it’s quite a compelling track even as they are a distinctly different from anything else in the album; the source tracks (9, 10, 11) are mostly light classical in nature; but Jansen’s dramatic score is highly interesting, modernistic, and satisfying. These two scores make a fine pair, and this release makes a fine album. George Clooney has made a fine and nicely entertaining movie about an aspect of World War II that’s always interested me, the Monuments, Fine Arts, and Archives (MFAA) program of the US Army, which was tasked with attempting to preserve artwork stolen by the Nazis during the war and return it to the museums, churches, and private collections from where it was taken. The film benefits from a great ensemble cast (in the tradition of great war films), superlative production value and visual effects, and an excellent and appropriate score by Alexandre Desplat that offers a fine, patriotic march as its primary theme and much melodic expressiveness throughout. The score is a simple one, which is what this film needs, which resonates with a nostalgic sense of patriotism and duty in a simpler time, when black and white were still solid colors. 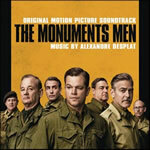 Desplat’s theme is flexible enough to serve as both a buoyant military march (“The Roosevelt Mission,” “Opening Titles,” “Basic Training” montage, and, with Mitch Miller whistling, over the “End Titles”), mixed in with action cues (“Altrausse”) and, in variations, as a sympathetic melody when events aren’t so positive, or when reflecting the terrible costs of war (“Normandy”). A rich secondary motif is introduced in “Ghent Altarpiece” and serves to classify the stolen art treasures that the Monuments Men are searching for, and which the Nazi’s hope to retain or destroy, and incoming the Russian Army hopes to acquire (“Deauville,” “Siegen Mine,” “Heilbronn Mine”). It an engaging score that worked well to give the film its necessary frivolity, sense of sacrifice and duty, and valued purpose. This 2011 Italian found-footage science fiction thriller from Alessio Liguori, REPORT 51: ALIEN INVASION, is kind of a cabin-in-the-woods picture where the cabin is a space ship and the demons are angry aliens as four friends set off into the woods to investigate a strange sighting and wind up in a nightmarish race for survival. The music is a mix of original music and licensed album tracks from veteran Italian film & TV composer Angelo Talocci, whose original contributions for this movie have been collected together into a 6:35 suite which plays as a sort of programmatic concert piece for the alien invasion. This music is assertive orchestral mixed with choir (presumably sampled) which carries a potently rhythmic aural aggression which is quite likable. 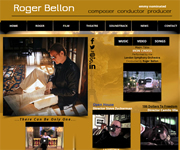 The other pieces on the album are rock-styled instrumentals (and one song by the band, The Irresistible Johnsons) licensed from the composer’s catalogue and were used as source and trailer music for promotion. The trailer music is especially evocative, with massive, orchestral strokes, huge choir sounds and vivid choral intonations, reaching peaks of symphonic power nicely distributed across the trailer’s four minute length. The licensed tracks are adequate but it’s in the original material (and the trailer assembly) that Talocci’s music especially shines and fits the film’s concept of alien contact even while it may seem to defy the rules of the “found footage film” (i.e., no music). 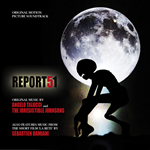 In addition to the 18-minutes of music from REPORT 51, MSM has given us 17 minute of music from director Liguori’s previous film entitled LA RETE (The Network). For this experimental revenge thriller French composer Sébastien Damiani provides a progressive soundscape of very intricate string writing mixed with creepy electronica. The later creates, in “Cellar,” “Transformation” (where the sound design is merged with a pretty but strident piano performance), and “Consciousness” (merging with a rush of choral sound) a particularly disturbing musical presence which is highly effective. The score concludes in “The Ending” with a menacing lullaby which offers little respite from the horrors of the former material, but concludes the score with an effective and potent round of renewed apprehension. A nicely done album that combines two different scores with very interesting and compatible sonic environments. Caldera Records presents two scores by the remarkable Turkish-born composer Pinar Toprak. She was recognized by the International Film Music Critics Association for Best Documentary Score in 2011 for THE WIND GODS, and in 2010 for Best Comedy Score with THE LIGHT KEEPERS. 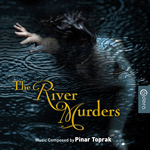 With a remarkable talent for expressive poignancy and melodic phrasing, Toprak’s score for THE RIVER MURDERS (aided by cello solos by Tina Guo) provides a haunting musical atmosphere for this 2007 murder thriller starring Ray Liotta and Christian Slater. Fragile melodies float across the music’s surface, enhanced by misty choral flavorings, while beneath the musical waters lie deep, foreboding tones of strings, keyboards, wisps of high soprano melisma, and a pervasive reverberating heartbeat of timpani. A melancholy primary theme is introduced in “The River Sorrow” [also the film’s original title], a flowing stream of cello set against the lovely voice of Liz Constantine and measures of wafting female choir. The fluidity of the melody line is contrasted against a series of angular cello strokes and strains; the theme is associated with Liotta’s detective character as well as his connection with the serial killer John – thus the contrasting melody and discordancy embedding into the theme. There is a strong, unhappy religious tone that runs throughout the score, which is a theme for John and his misguided motivations for killing, which oddly enough is the most beautiful music of the score. Elsewhere, Toprak builds a sinewy tonality of apprehension and unease which settles palpably into the soundscape, but which ultimately is overcome by John’s theme at the film’s climactic turning point, growing with a hymnlike fragrance into a striking atmosphere of sheer choral beauty. 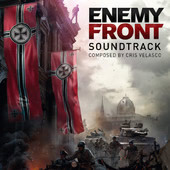 The film’s low budget required Toprak to make the most out of digital samples (Guo and Constantine are the only real live players on the score), but Toprak has interlaced and massaged the orchestral samples so well that the score reflects a convincingly credible orchestral/choral palette. The dozen tracks from THE RIVER MURDERS are followed by seven from the 2007 drama, SINNER, a very compatible score which is also softly atmospheric and largely string-based – and based on MIDI samples with solo violin and cello overlays. One of Toprak’s first solo scoring credits, the film had to do with a Catholic priest facing a professional and personal crisis in a compelling examination of ethics and morality. As with the first score, the music for SINNER captures an elegant but uneasy spiritual dimension associated with the conflict of the soul faced by the priest; at the same time the score’s orchestration suggests the rural environment in which the story occurs. These are both scores of sublime loveliness, both center on a religious/spiritual connotation inherent within the film. Despite SINNER’s coming very early in Pinar’s career, it shares the same sense of mature sincerity and confidence - and serenity of melody and expressiveness – with the other score, five years and 18 scores later. Caldera’s package is enhanced by detailed liner notes by Gergely Hubai and a 7-minute bonus track featuring a commentary about her background and about these scores by Toprak herself. With more than 30 feature film scores to her credit, Toprak is still an emerging composer on her way to the A-list, even though her work is among the most heartfelt and sincerely poignant music to come out of a hybrid arrangement in a long time. This affecting album has my highest recommendation, with thanks to Caldera for making it happen. 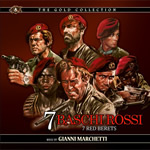 Kronos Records presents for the first time ever on CD and in its complete form Gianni Marchetti’s highly original, exotic, rhythmic score for the 1969 war/action film I SETTE BASCHI ROSSI (aka THE SEVEN RED BERETS, CONGO HELL and STURM DER FEUERVOGEL). Mario Siciliano’s film focused on a group of mercenaries tasked with retrieving government documents captured by a rebel army deep in the Congo jungle. Marchetti’s score was previously issued on LP by CAM, in 1970 with only 16 minutes of music. That program is included as this CDs first eight tracks, properly titled, while the remaining 23 tracks contains the rest of the score as heard in the film, including tracks left unused in the film’s release. The music is a fine mix of action scoring, faux ethnic music (lots of drumming with a male chorus which sounds unnaturally non-African in its gentle harmonies, but is quite effective all the same), heavy electric guitar chords interacting with piano and snare drum, and hints of the kind of melodic lounge music Marchetti and his Italian countrymen were fond of during the decade. The album tracks are best preserved for album listenability; they also contain a number of solo instrument recordings which are later heard in more fully orchestrated variations (solo acoustic guitar/solo acoustic with harsh electric guitar; solo harmonica/solo harmonica with piano and drums). Marchetti’s suspense tracks are especially provocative, nicely aggressive and integrated with the score’s various electronic and acoustic elements. Two variations of his main theme feature a whistler in the musical mix which captures a unique flavor. This is a very likable score with a stimulating musical palette, nicely presented. John Mansell provides a page of illuminating notes on the film and the music. 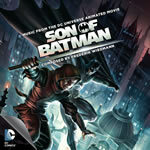 Frederik Wiedemann, who had a huge hit with his music for Warner Bros animated series THE GREEN LANTERN, two volumes of its music having been released by La-La Land, steps into the shadows to give his music for the latest Warner Bros animated super hero film, SON OF BATMAN. The music is not quite as bright as that of THE GREEN LANTERN, but stands in the more subdued, Gothic tradition of The Dark Knight. Wiedeman’s vigorous score has captured the Batman’s duality with music that is both heroic and slightly schizophrenic, mirroring the conflicted psyche of the caped crusader as he fights against crime in Gotham City with his son Damian, filling the role that Robin had in earlier crime fighting days. The music is articulate and vigorous, powering the young hero’s fight with broad orchestral strokes, and peppering his disillusionment with soulfully reflecting strains. “…There is such a strong emotional thread throughout between father and son,” Wiedmann said in a note in the album booklet. “Musically speaking, that had to be also the core of the score. I developed a theme for Batman that feels very real and more ‘human,’ and a theme for Damian that feels dark, but with a sense of hope… These two musical ideas are threaded throughout the story, guiding the development of our heroes, with a payoff at the very end when we hear Damian’s theme, Batman’s theme, and even the Robin Theme combined.” The 26 tracks proffer a vivid orchestral sound, yet one that is kept to the gloom most of the time, sharing the progressive dark chords that have evoked the Batman character since the days of Burton and Elfman. It all makes for a grand, surging album of brooding heroic elegance. Scottish born composer Scott Shields, former drummer for the UK band Gun, has written and performed the music for the British military action TV series, which debuted in 2010. The series follows the actions of Section 20, a secretive branch of the British Defense Intelligence service, which operate several high risk, priority missions throughout the globe. The soundtrack features the score from seasons three and four of the series. “In the 5 years that I have been scoring STRIKE BACK, I have followed the progress and growth of the characters, and the music developed organically with them,” said Shields. “At the start of the series, we used an orchestral brass section, cellos, military percussion and gave it a very British feel [assisted by Ilan Eshkeri]. In seasons three and four, we used the high intensity approach that we now have. The sound now reflects the edgy kind of music that our heroes would listen to and gives a very contemporary feel to the show. The battle sequences are driven forward with modern rock instruments, aggressive beat programming, cinematic percussion and complex synth textures, while the exotic locations used by the show allow me to experiment with ethnic vocalists and instrumentalists. I then like to blend the traditional with the modern sound of the series to create this hybrid score.” The title theme, a rock song called “Short Change Hero,” is quite compelling; the instrumental score is also rock-based but quite effective in conveying a cynical, modernesque sound for covert military action. While those tracks are pretty aggressive in their straightforward rock and roll (“Put Your Hands Up” is a pretty effective rollicking action track, and “Release the Virus” is a strong and propulsive rhythm cue for guitars), quieter cues like “What Happened In Beirut” and the first half of “Interrogating Prisoner” are accompanied by effectively arranged suspense cues using the electronic instruments in more of an orchestral manner; “Rebecca Headshot” is given a poignant melodic treatment with female voice and violin, while “Killing the Love” adds that melodic serenity to a more strident electric guitar underbelly. “Executing Dryer” is a poignant melody for synth-strings and voice over guitars and percussion that intones a very powerful dramatic evocation. The score concludes triumphantly with the rhythm guitar anthem “Yes I Do.” This is a very good rock and roll-based score which integrates elements of traditional scoring with a few measures of song-oriented rock music, which gives the series a unique sonic structure and makes for a fine and rather unique album in its stylistic approach to macho military action. 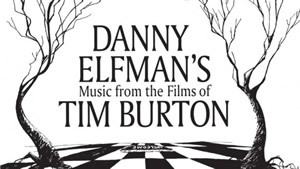 Danny Elfman’s Music from the Films of Tim Burton will hold two limited engagements at the Nokia Theater L.A. Live on Friday, October 31st and the Honda Center on Sunday, November 2nd in Los Angeles. The concert will include original suites from all 16 film collaborations between Elfman and Burton. Elfman himself will perform his iconic songs from THE NIGHTMARE BEFORE CHRISTMAS, for which he was the singing voice of Jack Skellington. Tickets priced from $55.00 are available through AXS.com & through Ticketmaster.com, and by phone at (888) 929-7849 or (800) 745-3000. Nokia Theatre L.A. LIVE is located at 777 Chick Hearn Ct., Los Angeles, CA 90015. Honda Center is located at 2695 E. Katella Ave., Anaheim, CA 92806. The orchestral performance will include music from BATMAN, EDWARD SCISSORHANDS, THE NIGHTMARE BEFORE CHRISTMAS, BEETLEJUICE, CHARLIE AND THE CHOCOLATE FACTORY, ALICE IN WONDERLAND and others on the program. The concert is conducted by John Mauceri featuring an 87-piece orchestra and 45-person choir. Mauceri, regarded as one of the world’s leading conductors of live film music, was Director of the Hollywood Bowl Orchestra for 15 years. For his farewell concert in 2006 Mauceri commissioned Danny Elfman to compose The Overeager Overture. Mauceri also conducted the recording of Elfman’s classical work, Serenada Schizophrenia. This will be Elfman’s second time performing in the U.S. since the Farewell: Live from the Universal Amphitheatre concert with Oingo Boingo on Halloween in 1995. Last year’s concert sold-out within days the tickets were made available. Elfman returns for the Southern California concerts following SOLD OUT concerts in seven countries including the legendary Royal Albert Hall in London. Presale tickets are now on sale from AXS.com/Ticketmaster.com. Whether or not you like the GAME OF THRONES theme, you will probably enjoy the version of it, wherein the Swamp Donkeys perform a spot-on interpretation of Ramin Djawadi’s series theme in terrific Dixieland jazz style. Here are a few excerpts from a two hour in-depth interview with the distinguished film composer: Patrick Doyle for the Film Music Foundation. Here he discusses his film scoring techniques and working on BRAVE, THOR, RISE OF THE PLANET OF THE APES and MARY SHELLEY’S FRANKENSTEIN. La-La Land’s second title is the premiere release of Marvin Hamlisch’s score for D.A.R.Y.L., Simon Wincer’s 1985 sci-fi drama. Upcoming scoring assignments for Michael Giacchino include TOMORROWLAND, JUPITER ASCENDING, DAWN OF THE PLANET OF THE APES, and JURASSIC WORLD, the fourth installment of the sci-fi series. 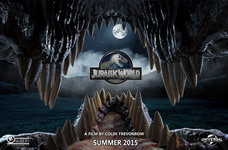 This new sequel is directed by Colin Trevorrow (the delightful indie sci-fi/dramedy SAFETY NOT GUARANTEED) and takes place 20 years after the events in JURASSIC PARK. 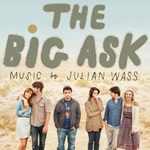 Composer, producer, instrumentalist Julian Wass will release three original motion picture soundtracks this summer: the first, released last month, was for Tribeca Film’s dark comedy THE BIG ASK (Wass: “We came up with a an epic guitar sound that we felt embodies the expansiveness and relentlessness of the desert, and although this sound is heard early in the film, as the story progresses and the desert setting becomes more odd, that sound takes over”), THE PRETTY ONE, written and directed by Julian’s wife Jenée LaMarque (Wass: “I wanted to lend a timeless, ethereal quality to compliment the fairy tale aspects of THE PRETTY ONE, and Jenée and I agreed that an electronic score, with acoustic elements, would fit the images and tone really well”), and LOST FOR LIFE, a documentary film from director Joshua Rofé that tells the story of more than 2000 people in the US who are serving life without parole sentences for crimes they committed as juveniles (“My concept for the score was to take familiar instruments, like piano, flute and strings, and manipulate them to remove a part of the sound. For example, I recorded my piano, loaded it into a sampler, then removed the sound of the hammer striking the key. What was left was the tail of a piano, almost the ghost of a piano. Joshua and I felt this was a perfect way to reflect the missing pieces of the families in the movie, with these digitally homemade (or home-ruined!) instruments”). From Milan Music comes the score for THE SACRAMENT, Ti West’s powerful take on suicide cults that shows a deep understanding of the hold a leader can have over a trusting populace. The film’s charismatic Father is a clear stand-in for the infamous Jim Jones, who led hundreds to a mass suicide at Jonestown in 1978. The soundtrack album combines pieces of dialogue (boo!) 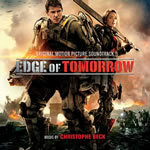 with soundscapes by Graham Reznick and an ominous and pulsating score by Tyler Bates. 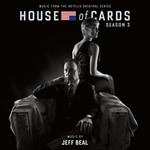 Varese Sarabande is releasing this coming week the soundtrack by Jeff Beal to HOUSE OF CARDS, Season 2, as a 2-CD set. Beal received two Emmy nominations for his for score and theme for the show’s first season. Coming up from Varese is Marco Beltrami’s music for SNOWPIERCER (previously issued as a Korean import last August) on July 22, Brian Tyler’s INTO THE STORM on August, and, date TBA, Chris Bacon’s dark, moody, appropriately Herrmannesque music for the PSYCHO prequel TV series, BATES MOTEL. 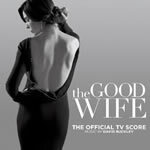 THE GOOD WIFE Season 5 score album by composer David Buckley is available on Amazon.com through CBS Records. His baroque approach to contemporary classical composition sets the dramatic tone for the award winning series starring Julianna Margulies and Josh Charles. Buckley is submitting his music for Emmy consideration for the first time in the series’ history. As the characters have developed in the fifth season, so has Buckley’s music. His score is now more prevalent than ever with his lush orchestral music unique to contemporary television. Composer Kevin Kliesch (THUNDERCATS, SUPERMAN: UNBOUND) has earned his first Daytime EMMY® nomination for his work on the hit Disney Junior series SOFIA THE FIRST. ”Once I found out I had been nominated from the show’s creator, Craig Gerber, I immediately woke up my wife and told her the good news. We were both shaking with excitement!” said Kliesch. “It was such an honor to hear that the Academy thought my music for SOFIA THE FIRST was award-worthy.” Though primarily a daytime show, airing 9:30AM on The Disney Channel as part of the Disney Junior programming, a SOFIA THE FIRST primetime special, The Floating Palace aired last year. Which means, though improbable, Kliesch could potentially be recognized with a primetime EMMY nomination later this year for the same show – a highly unusual occurrence in the music categories. A just-released music video for “World Cup, It’s Time!” is now available, in perfect time for the 2014 World Cup, on ASCAP’s YouTube channel. 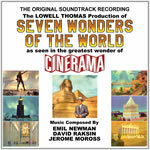 Sepia records offers on CD for the first time, the unique soundtrack to the Cinerama Production of SEVEN WONDERS OF THE WORLD, mixed from the original tapes. This widescreen extravaganza features the varied and dazzling music of three composers - Emil Newman, who also conducted the Cinerama Symphony Orchestra for the sound track, David Raskin and Jerome Moross. Frederik Wiedmann’s latest film project is the Civil War drama FIELD OF LOST SHOES, directed by Sean McNamara (SOUL SURFER, BRATZ). The film is about the Battle of New Market fought in 1964 in Virginia. 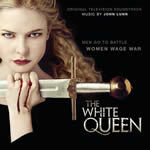 Silva Screen has announced a June 30th release of John Lunn’s soundtrack top the BBC TV series, THE WHITE QUEEN. This adaptation of Philippa Gregory’s bestselling historical novels set against the backdrop The War of the Roses was the main event for BBC One’s drama schedule in the summer of 2013 and was celebrated for the return to form of classic BBC drama. The lavish and costly 10 hour series, co-produced by premium US TV cable channel Starz was sold worldwide and a second series is under consideration at present. Scottish composer John Lunn is famed for his Emmy award winning scores for DOWNTON ABBEY but his 25 year career as one of the UK’s foremost writers for music in television is equally glittering right across the board. 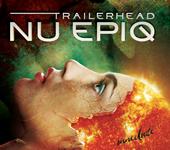 Imperativa Records, specializing in the ‘Epic Music’ genre, presents Immediate’s genre-defining new album, Trailerhead: NU EPIQ, the fourth volume of the highly successful Trailerhead album series devoted to the power and emotion of epic orchestral music. Led by pioneering Emmy® award-winning composer and producer Yoav Goren, who first introduced original ‘Epic Music’ for blockbuster movie trailers over twenty years ago, Immediate are widely recognized as Hollywood’s pre-eminent producers of original music for major motion picture trailers. Ranging from anthemic orchestral soundtracks to symphonic rock, contemporary classical, and power pop, the ‘Epic Music’ genre is unified by the incorporation of real orchestra and choir recorded in some of the best sounding halls and studios in the world. The music, while spanning a variety of styles, shares similar emotional values which encapsulates the contemporary music category known as ‘Epic Music.’ Trailerhead: NU EPIQ infuses a new modern sound and an evolved compositional approach while continuing the tradition of featuring modern orchestral and choral compositions blended with contemporary electronics, rock and synthesis. The album features 19 original tracks of incredibly anthemic, emotional cinematic music that transcend the medium, existing independently as a legitimate form of artistic expression with a rapidly growing and fervent fanbase, as well as featuring in the latest trailers for Hollywood blockbuster movies. (See my interview with Immediate’s Yoav Goren in my March 2013 column). Lakeshore has also released Johnny Klimek’s WOLF CREEK II, sequel to the 2005 outback horror film about another set of unwitting tourist who falls prey for a crazed, serial-killing pig-hunter. Klimek, working solo after an ongoing, and very notable, scoring collaboration with Reinhold Heil and Tom Tykwer. “The score is purely electronic, meaning I used a lot of ‘organic’ orchestra recordings and treated them electronically,” said Klimek. “[Director] Greg [McLean] told me that he wanted a very disturbing sounding score, something that makes the audience feel uncomfortable. He was going for a more atonal vibe, almost like sound design, not a typical horror score.” Lakeshore’s album features songs by The Tokens, Steppenwolf, Nellie Melba, and Patsy Cline. Next, Klimek is set to score Kriv Stender’s KILL ME THREE TIMES, and the Netflix original series SENSE 8. He recent projects include HBO’s THE NEWSROOM and FOX’s MIND GAMES. 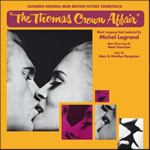 Quartet Records and MGM are proud to present the world premiere release of Michel Legrand’s complete original soundtrack from the highly sophisticated 1968 thriller THE THOMAS CROWN AFFAIR. Having just moved to Los Angeles after the success of THE UMBRELLAS OF CHERBOURG, Michel Legrand infused his music with a new, fresh and never-before-heard style, mixing influences of jazz, pop, Baroque and Stravinsky. It was sophisticated and chic—and worked perfectly with the film. This CD contains the remastered album presentation (with much-improved sound) plus the entire original recording presented from mono elements, courtesy of MGM. The package includes a 16-page full-color booklet with liner notes by Legrand biographer Stéphane Lerouge, including quotes from the composer, Norman Jewison, Alan & Marilyn Bergman and Alexandre Desplat. A limited release of 1,000 copies. Also announced is a limited edition and expanded release (500 copies – sold out at the label’s site) of Ennio Morricone’s sublime scores from 1969/1970, LA MONACA DI MONZA / LA CALIFFA, both newly remastered. A 20-page full-color booklet features many illustrations and a detailed discussion of both scores by Gergely Hubai, who also provides track-by-track analyses for these masterful works. 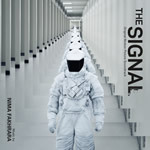 Varèse Sarabande Records has released the soundtrack to THE SIGNAL, featuring the original score by Los Angeles based film composer Nima Fakhara (GATCHAMAN, EXISTS), who created and built three instruments for the film. “We wanted to achieve a certain sense mystery and tension throughout the film,” said Fakhara. ”Our characters are being pulled and pushed in many directions so the music had to feel the same. We also wanted keep the audience guessing throughout the film by scoring scenes in unconventional ways.” For THE SIGNAL, “I built three instruments that became the signature sounds of the project. The Pagoda (tree-like thing), the Transmission (what seems like a transmission) and the Steel Marimba (Marimba looking thing). They are used in many different ways, both by using their natural sounds and manipulating the sounds to get cool textures.” To view pictures of these three instruments, visit http://ow.ly/xDll3. 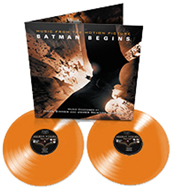 Silva Screen Records has announced that Hans Zimmer’s score for BATMAN BEGINS will be released as a 2-record set on orange vinyl, keeping in with the color palette heavily used throughout the film. “I, Austin Wintory, am facing a $50,000 fine from my own union for - The American Federation of Musicians - and have decided to speak up against my union’s blockage of ALL new video game recordings…. For almost two years now, under this contract, no union member has been allowed to work on a new video game soundtrack as a result. This contract created an untenable situation. Composers and musicians have continued to need to earn a living in this industry. Those musicians and composers therefore we’ve been forced to work without union sanction because the union has failed to sign any video game companies to work with them in almost two years. Ubisoft has released Olivier Deriviere’s Assassin’s Creed IV Freedom Cry Original Soundtrack, which is now available on iTunes and Amazon. Hear the main theme music at: https://soundcloud.com/waystone-games/dawngate-main-theme . 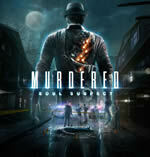 Jason Graves (Tomb Raider, Dead Space) provides an intense, modern cinematic score for Murdered: Soul Suspect, the supernatural detective thriller video game from Airtight Games and SQUARE ENIX. A new take on the action/adventure genre, Murdered: Soul Suspect challenges players to solve possibly the hardest case of all...their own murder. Graves’ masterful atmospheric score illustrates the game’s story and character arcs through a visceral hybrid approach, combining themes and textures performed by live string quartet with found sounds and experimental percussion.